The Moscow Mule is an oddly named cocktail with a history that was decades ahead of its time. The first half of its name is easy enough to figure out. Invented in 1941 California, the Moscow Mule helped fuel an American craze for vodka that peaked in the next decade. U.S. citizens associated vodka with Russia, and so the USSR’s capital city became ingrained within the cocktail’s title. The Motown Mule contained vodka, ginger ale, and two muddled cherries. But many wonder: why “mule”? Perhaps because the cocktail packs a potent kick — like a mule? Nobody knows for sure. It seems to be an answer lost within the hazy past of cocktail culture. Though that doesn’t keep us in the here and now from guessing. It was a topic of conversation during a June 9 celebration of the cocktail, hosted by Smirnoff Vodka at Spyglass Rooftop Bar, atop the Archer Hotel in Manhattan. Predictions of rain proved incorrect, and we guests enjoyed stunning views of the surrounding skyline — not to mention an array of mules. There was the classic: vodka, ginger beer, simple syrup and lime juice. Also on the menu were two winners from the Moscow Mule challenge hosted last year by Smirnoff and Shiftgig. The Black Apple Mule contained vodka, ginger beer, black walnut bitters, diced apple and lime juice. The Motown Mule had vodka, ginger ale, and two muddled cherries. It was very tart and fruity. Naturally, all these drinks were served in copper mugs. 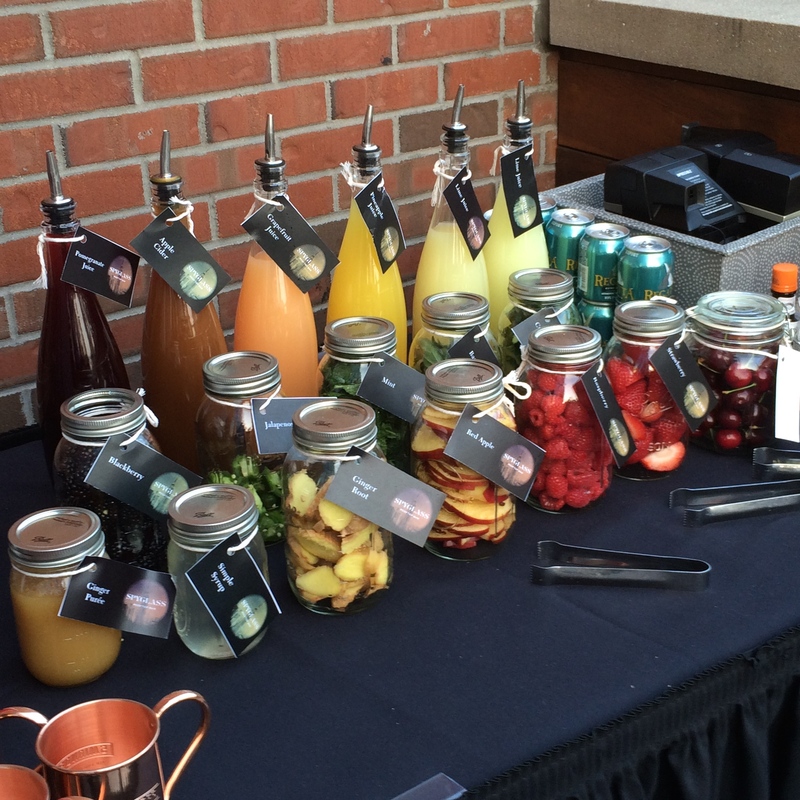 Guests were also treated to a Make Your Own Mule Station. In my mug I muddled ginger roots, mint and raspberries, before mixing in apple cider, lemon juice, vodka and ginger beer. Diageo’s head mixologist Elayne Duff was on hand to help those of us (like yrs. truly) who were not so adept at cocktail creation. The Make Your Own Mule Station. Duff also gave a presentation on how to make a Moscow Mule (pictured above). One technique of note: she poured the ginger beer down her mixing spoon. And as she put together her cocktail, she recalled its history. In 1941, John G. Martin, of Heublein (now a property of Diageo), was having a hard time selling Smirnoff vodka, a brand he had bought years earlier. So he teamed with another businessman struggling to move ginger beer, and together they developed one solution to both their problems: the Moscow Mule. But new drinks don’t sell themselves. The pair traveled from bar to bar, introducing bartenders to their cocktail. Martin and his partner also packed a Polaroid camera. They took two photos of each bartender who made a mule. One picture they gave to their new customer. The other, they showed to the next bar they visited — a sly way to show what the competition was up to. This campaign was not unlike social media promotions of current day. Spread around fun images of a new concept and it might just catch on. Or so Duff explained, welcoming guests to be photographed by a vintage Polaroid camera, and then upload the physical picture onto Instagram. It was a fitting activity for an evening that tied together cocktail culture past and present. How exciting! 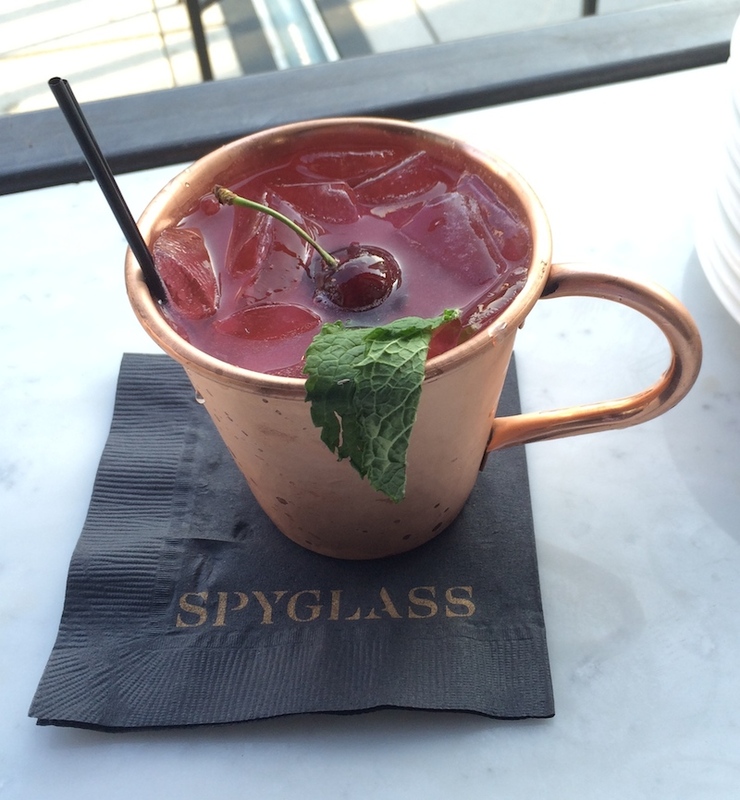 My Black Apple Mule recipe make at the Spyglass Bar! This was so much fun to develop and I’m thrilled it’s being shared.